Even the priests are leaving the country - only 1,900 families are left. Even priests are now leaving Syria in an effort to protect their children and grandchildren. In the region of Aleppo, near the border with Turkey, in 2010 there were living 75,000 Orthodox Christian families. In 2013 their number was reduced by fifty thousand. Today, according to the most optimistic estimates, there are no more than 1,900 families. And of the 20 priests that shepherded the city and villages around Aleppo, today there remain only 2. "It's tragic. Everyday we try to help keep the people standing. But what can you say to these people? They're tired of fighting. They can no longer bear battling. They try to survive in extremely harsh conditions, but the fear that they may lose at any time one of their children or grandchildren is great," says Metropolitan Saba of Houran and Bosra of the Patriarchate of Antioch to the Vima, who serves near the border of Jordan. He adds: "Churches and schools have been destroyed. Everyday you see in the streets people who carry their few belongings, and try to take refuge in Jordan and Damascus to escape the war. All they think about is finding a safe place." Metropolitan Saba, and all the bishops who serve the Patriarchate of Antioch in Syria, are trying to fulfill their duties selflessly. Despite the abductions and killings of clerics and monks, they remain there handing out food and medicine daily. Even in the capital of Damascus, the priests who live there are trying to find ways to escape. Already out of the 30 married priests who serve there, 5 have followed the path of refuge. "I've been away from my homeland for two years. And I came to visit my elder father and my siblings. The pain is endless. Daily there are dead and wounded. Dozens stop me in the street and ask me how they can leave for abroad," said Bishop Isaac of the Patriarchate of Antioch, who in recent years has been serving in Germany. "I liturgized here in Damascus on Sunday and around me, in a parish that used to be full of life, of young people and children, I saw very few, and the vast majority of them were people of old age. It is these people who refuse to leave, refusing to leave the graves of their ancestors, who never forget that Christianity is part of the history and tradition of this place," said Bishop Isaac. 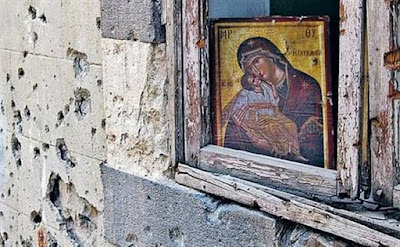 The Christian presence in Syria goes back to the time of the Apostle Paul. Millions of Christians have been born and raised for centuries in the area known today as Syria. Having survived dozens of wars, they have managed to withstand. "The thriving Orthodox community, with its parishes that are jewels in the global community, with its hospitals, with its own nursing homes, schools and universities; with members that included proud farmers of the land, merchants, intellectuals, officials and ministers, today is dying.... There are many who fear that perhaps they will follow the tragic fate of the Christians in Iran and Iraq," said Bishop Isaac.